Assisi in Umbria is famous as the birthplace of Saint Francis, the Dr Dolittle of the Catholic Church, and the Patron Saint of Italy. It’s a perfect central Italian hill town where the modern suburbs have been confined to the plain below leaving the town itself its ancient aspect. The plain is sheltered by Monte Subasio which rises to 1,290m and this has created almost perfect conditions for growing vines. 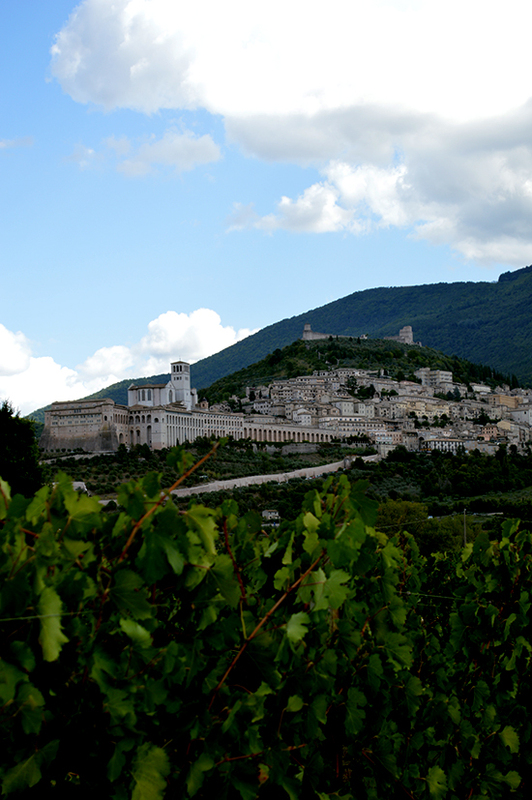 And it is indeed home to Saio, one of the largest grape producers in Assisi and producers of one of my favourite wines. Saio, the name of which refers to the monk’s habits worn by Saint Francis’s followers up on the hill, is also one of the newest wineries in the area. The Mencarelli family started producing their own wine about fifteen years ago, having previously sold the grapes grown on their 15 hectares, to other producers. A couple of weeks ago, we decided to go and visit Saio, in order to taste their current vintage but also to take advantage of the fact that they will allow you to have a picnic in their vineyard, which has the most stunning uninterrupted views of Assisi. We were shown around by Irene Mencarelli and her husband Gabriele Commodi. I was a little worried that it might be a bad time since early September is the time of the vintage. As Saio grows a wide variety of grapes (sangiovese, merlot, and the cabernets—sauvignon and franc—on the red side, and grechetto, chardonnay, and viognier on the white) the vintage is normally spread over a few weeks as all the varieties come individually to ripeness. However, this year, as Gabriele explained, the whites ripened late and the reds early and all the harvest was done in a week, save the merlot which were not yet ready. So in fact, it was time for a rest. As you can see from the pack shot, Saio produce six principle wines: 100% sangiovese, a 60% merlot / 40% sangiovese, a 60% merlot / 40% cabernet sauvignon blend, and a 50% sangiovese and 50% cabernet franc; whites comprise a grechetto, and an 80% chardonnay / 20% viognier). Although I would class all these wines as excellent, my favourites are the grechetto—a beautiful straw coloured wine with hints of peach and apple—and the merlot sangiovese, packed full of ripe red fruit which stay in the mouth for a long time. As with all wines, these are best paired with local produce and so we went off into the vineyards to have a picnic of local salami and cheese served with typical torta al testo bread. A new discovery, via the picnic, was tozzetti an Umbrian variation on Tuscan cantuccini or biscotti di Prato. These were pretty much the same but contained aniseed and we were encouraged to dip them in red wine before eating. The red wine gives them an extraordinary savoury flavour. I will be coming up with the recipe for these in the coming weeks. Needless to say, I brought a lot of wine home with me, which is now sitting in the cellar at La Madera waiting to make some meals memorable. Thanks again to my friends at Ottimi Vini for introducing me to Saio. 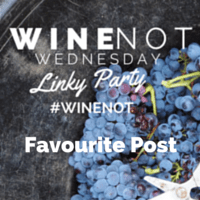 This post was chosen as the favourite post for the #winenot linky party #14 (November 2015). Thank you so much, I’m really honoured! To see the other posts or to join in visit Willunga Wino or Champagne and Chips. Or why not just visit them anyway as they are fabulous wine blogs.